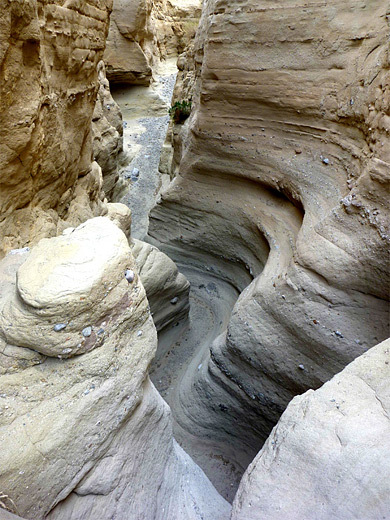 Amongst the variety of landscapes in southern California's Anza Borrego Desert State Park are numerous canyons, ranging from V-shaped valleys at the edge of the mountains in the north and west to rocky washes in the desert areas of the south and east. 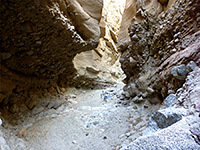 These are mostly quite shallow, except where they cut through certain resistant sandstone layers, where they form slot canyons up to 100 feet deep and typically narrow for half a mile or so. The rocks tend to be rather weathered and pale in color, and although the canyons are not particularly pretty they do have good curving passages, interesting rock textures and are generally easy to explore. 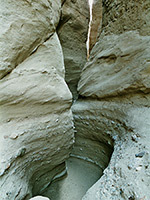 Most slot canyons are found around the undulating badlands that extend from the southern and eastern foothills of the Santa Rosa Mountains, in the northeast corner of the park. Some can be seen from country road S22, the main highway through this area - any of the dozens of dry washes that radiate from the mountains over a 10 mile section of the road are likely to become deep and narrow for a while if followed upstream. 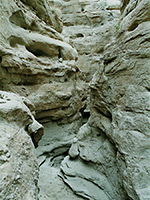 The largest drainage hereabouts is Palm Wash, which has three main forks, each branching several more times, and most canyons can be explored starting from the trailhead to Calcite Mine, an area two miles from the road that was used for excavation of calcite by the military in the 1940s. 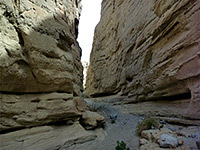 This location is just inside the state park boundary; a 4WD track drops into a valley (the South Fork) beside the road, climbs the far side and continues to ascend gradually, passing above other small canyons and crossing the Middle Fork after about 1.5 miles. The North Fork is more distant, and although it could be reached by hiking downstream along the South Fork to the confluence, then upstream a similar distance, a shorter approach would start further east along S22. Cross-country travel is this region is not generally recommended owing to steep slopes covered by loose stones, and confusing topography. Calcite Mine is 1.8 miles from S22 and 540 feet above, high enough to have good views over the weathered, undulating surroundings. Some of the rocky outcrops are nicely eroded, displaying tafoni-like textures, but the mine itself is not so interesting, as the only relics are some shallow trenches, partially filled in. There are many small pieces of calcite scattered about, and some of the source veins are still visible, in the walls of the trenches. Various lesser trails head off in different directions, climbing further into the hills. Topographic map of the Palm Wash area. 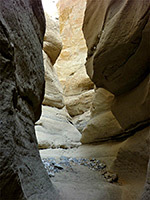 33 views of the Palm Wash slot canyons, and Calcite Mine; gallery, slideshow. The Calcite Mine trailhead lies in a barren area, dry and dusty, with very little plant life, only ocotillo in addition to the usual nondescript, straggly bushes. The parking area is on the south side of hwy S22, 0.6 miles west of the state park entrance, right opposite the jeep track down into the South Fork canyon, and next to an emergency phone. In the other direction, another track (the Truckhaven Trail) heads off across flat desert. The route to the narrows of the Middle Fork starts by following the jeep track in and out of the South Fork, up a gradually rising ridge then along a side track on the right, which soon descends into the lower end of the target drainage. Walking upstream, the state park boundary is marked by a sign, at the end of a section of the streambed which is accessible to 4WD vehicles. 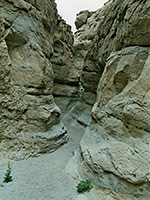 The canyon divides after the next bend; the left fork leads to some very shallow slots, but the main drainage is to the right. This rises above a dryfall and is straight for while, gaining height via boulder piles and smaller falls. After a wide bend and a minor tributary on the left, the drainage is more enclosed; the walls are nearly vertical, still relatively far apart though becoming gradually less so. The deepest and narrowest part extends for about a quarter of a mile. The floor is U-shaped in profile, a mix of pebbles and bare rock, as the drainage cuts through angled strata, alternating between conglomerate and more homogenous layers. All the rocks are grey or pale brown, so the narrows are never very colorful. Two chokestones above dryfalls create more significant obstacles, but webbing and a short rope seems usually to be left in place, to assist when climbing up. Some sections have a few tight bends, where the way ahead is apparent only when close-up. An adit penetrates a little way into the cliffs, following a seam of calcite. Soon after this, a tributary on the left provides an easy exit route, leading to the open, gravelly slopes just east of the mine. Beyond the side ravine are a short conglomerate section and another dryfall, above which the canyon is rather less deep, though it continues a lot further, gaining elevation more steeply. The track to Calcite Mine is very rough and parts are too rocky and rutted even for some 4WD vehicles so most people make the journey on foot. It is about a mile from the trailhead on S22 to the crossing of the Middle Fork, easily recognizable as the track descends quite steeply to the canyon floor, just below the lower end of the narrows. The rocks here are whitish grey and have the same form and texture as those in the main branch. The passageways are quite sinuous with tight curves and a floor of smooth rock, but this slot like section doesn't extend very far - beyond is a more open stretch then some shallower narrows that end beneath a dryfall. All can be explored in just 30 minutes, from the road. 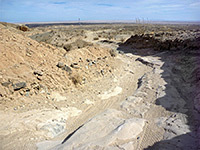 The South Fork of Palm Wash runs alongside S22 for a few miles, either side of the Calcite Mine trailhead. The road follows the top of a narrowish ridge and offers great views of many square miles of badlands and canyons to the north. There is a small carpark next to the start of the trail and another a short distance west, overlooking the valley which at this point is broad and open. 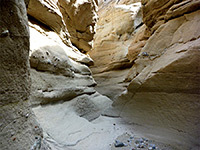 The interesting part of the canyon is reached after walking upstream along the level sandy floor for about half a mile - a fallen slab of rock creating a natural bridge marks the point where the walls become vertical, although the true narrows are found after another 20 minutes walking and extend for a few hundred yards. 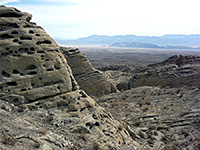 The rocks are composed of various similarly textured coarse sandstone layers, pale brown in color, some of which have a knobbly appearance due to embedded pebbles. 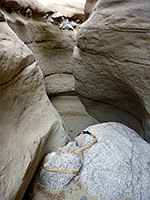 There are no obstructions in the canyon, which opens out to a wider section still with sheer walls and angled, dusty, weathered strata, that enclose a streamway filled with large boulders and sandy patches. 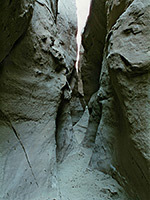 Several branches fork off on both sides, while the main canyon eventually ends beneath a dryfall of about 30 feet.